I don’t know about you, but I am not a lawyer. I am not a professional when it comes to knowing what structure works best for a business. I can guess, but it is always great to have someone who can guide you through that process. Thanks to Intuit, you don’t have to guess. These guys are the creators of TurboTax and Quicken, but they don’t stop there. They have created mycorporation to help small businesses and startups launch their businesses without too much hassle. Mycorporation helps you file your article of organization or incorporation fast. You can also access to the legal documents that are pre-written for you, so you can use them to develop your own LLC agreement and LLC minutes. You can also use mycorporation services to take care of trademarks and patents. You can always buy a book to help you do these things, but why spend time doing things that are not related to your core business activities when you can use your time to make money for your business. What I like about mycorporation is the fact that they help you create your company and stay atop of your reporting requirements at the same time. Most states require you to file an annual report, which means unless you want to deal with late fees and liens against your business, you want to keep up with your requirements. These guys do that for you, and you’ll have one less headache to worry about. I strongly recommend mycorporation as not only it saves you time, it saves you from reading all kinds of legal books or paying a lawyer $200 an hour to give you an advice. All the information that you need is available, and mycorporation’s customer service walks you through the process. It can’t be easier. And you have the backing of Intuit which should give you the piece of mind that you are leaving your company in a credible hands. *for a limited time, you can form your corporation or LLC free of charge (+ state fees) on mycorporation.com. This is a very limited time offer, so take advantage of it while you can. When you start your own business online for the very first time, you are going to soon realize the challenge of getting traffic to your website. You can have the best website on the Web but if you are not getting folks to visit it, you are not going to have much success. Traffic Secrets 2.0 by John Reese is one of the best traffic courses that money can buy. The first Traffic Secrets came out a few years ago, and it was a powerful course. But the second edition is now updated to cover the age of Twitter and Facebook. The first CD is the shortest one in the series. Not only you learn how to get the best out of the course, but John goes on to explain his philosophy on generating traffic and building business. Some of the concepts explained in this CD are very straight forward, but it’s amazing how many people ignore them on a daily basis. 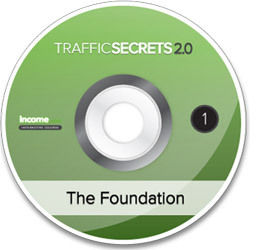 You may be tempted to skip this CD but if you are new to the business of building traffic, you should listen to the third lesson on this CD. Forum Research: you’ll learn where you need to hang out to gain competitive information in your niche. Blog Research: one thing that doesn’t stop in today’s world is blogs talking about things. By knowing where to look, you can gain incredibly valuable information about your niche. Article Research: looking at article directories and E-zines to find out what’s going on in your market can give you extremely valuable information about your market. Social Media Research: Whether it’s video or social networking sites, you can gain a lot of good info about your market from this new channel. Traffic Research: the most powerful lesson on this CD. You’ll learn how to read trends, how to analyze links, how to analyze traffic, and how to automate your tracking process. The third CD is all about keyword research. Not only you’ll learn how to use some of the free tools that are available online, you’ll also get familiar with some of the paid tools such as SpyFu and Wordze. You’ll also learn how to use analytical tools to find out where you are getting your traffic from, and how to optimize your pages to get more organic traffic. A lot of folks hesitate when it comes to taking advantage of paid tools, but there is a whole other life after free tools such as Google Adwords Keyword tool. You’ll learn about some of the more popular paid tools and how you can use them to not only generate new keywords, but also spy on your competitors. How to use LSI Keywords to push your Google ranking to a whole other level. What on-page factors you need to pay attention to. How to buy domains that will guarantee you a higher spot on the SERPs. How to optimize your site structure for search engines. How to build links like a pro! How to use a CMS and supplement it with a Site-map to create SEO friendly sites fast. How to effectively use Google Analytics for SEO. Crash Course: a crash course on how to create your very own content factory. Methods: methods you can use to produce your very own content. Link Bait Strategies: want to be on the front page of Digg or gain lots of links. It’s all covered here. Article: how to write and publish your own articles online and gain back-links. Casting: creating a podcast is nothing new these days. But if you are not doing it now, you will after listening to this. Content Launch: John is a world class expert when it comes to product launches. He shows you how to launch your content too. Production: various methods on how to create content are discussed here (including hiring your own writers).